If you are working online, the main question that arises in your mind is how to get your payment to your bank account?. This can be done through online payment processors such as PayPal, Payza, Perfect Money and lot more. Here in this article, I am going to explain to you how to create a Payza Account to get payments from online jobs. Also, you can read the Payza review and post your comments about your recent payments from Payza. 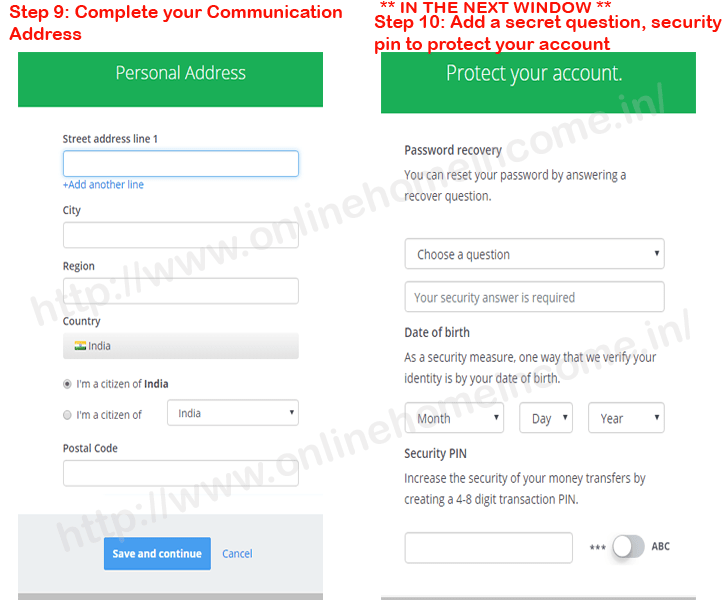 Read this article about How to register PayPal account and verify PayPal account? Payza is free and supports worldwide payments for all country currencies. Because if you work for online companies were you do not know their exact location and also payments via international banks is a risky one and will take a number of days to reach your bank account. These Payment processors do enable instant payments for any country currencies and will convert other country currencies to your local country and deposit in your bank account which you submitted. These payment processors do solve those issues in payments from online jobs, paves way for instant payments. If you are going to start an online job then first and foremost you need to open an account in these payment processors. Do not worry about your account safety because Payza is 100% secure. All online jobs sites will pay to your bank account via PayPal and Payza. 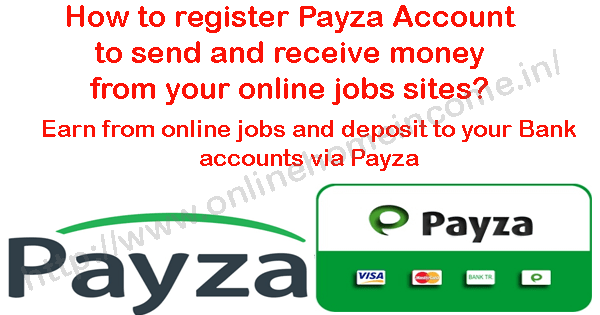 These are the must requirements to register Payza account. If you do not have Pan card, you should apply for the one now through your local Government E-services and get in next 15days. 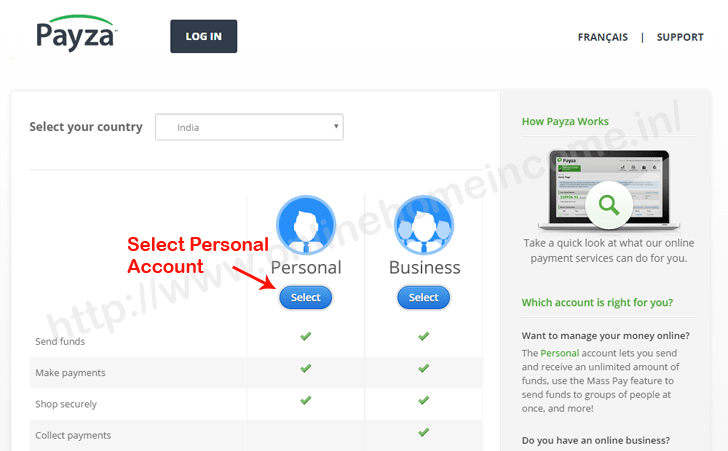 How to open an account in Payza? 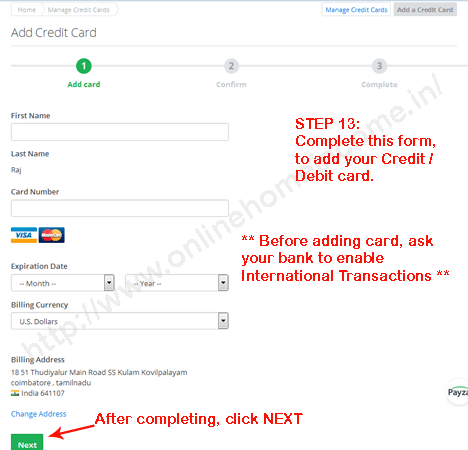 This article gives you further step by step guide about how to open a Payza account. Sign up for a free Payza account by click here and/or below banner to open the home page. STEP 1: Now press “Sign up” Button and wait for the next page to load. STEP 2: In this page, first select your Country and the account type as Personal. STEP 3: In the next window, you will be provided a registration form. Enter your First name, Last name, Email address, Password for secured login into Payza. Complete the registration processes by clicking GET STARTED. STEP 4: Now you will be asked validate your Gmail Account because to confirm you are the right account holder. 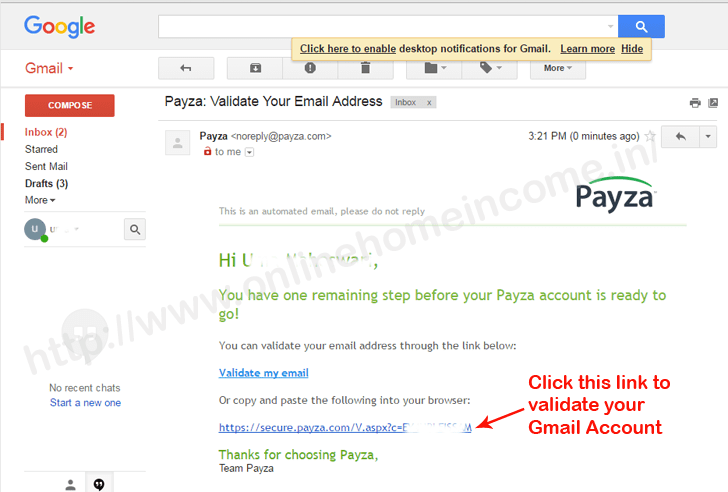 STEP 5: Open your Gmail account and look for the mail from Payza Verification. Click the confirmation link in the mail to get your mail id validated. STEP 6: Now, it’s time to set up your profile. In order to gain full access to your account, you need to complete your profile setup. Just follow the Onscreen Virtual assistance popup that will guide you through the rest of the process. STEP 7: involves you to tell them why you need Payza account. Select Industry and your Job. Save and continue. 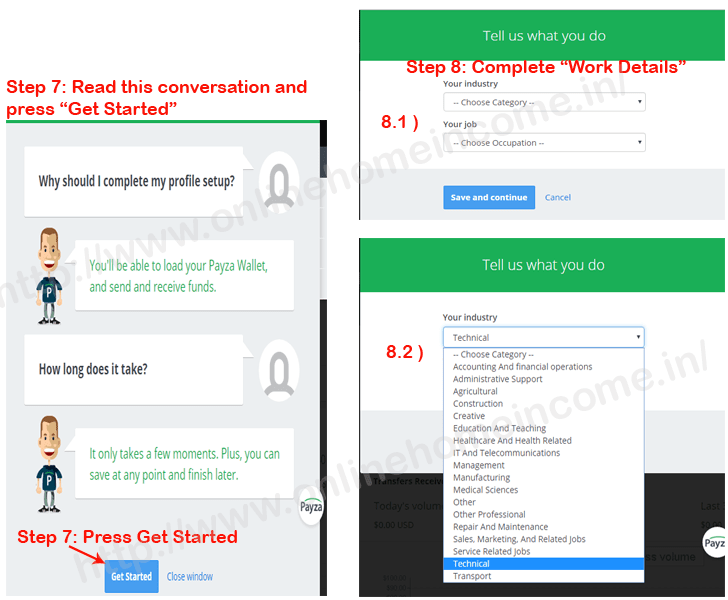 STEP 8: Here you need to fill up your communication address in Detail and click Save and Continue. 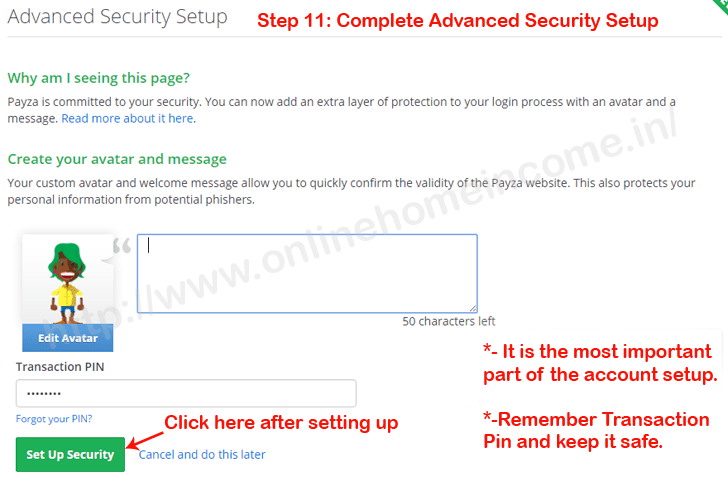 STEP 9: Protect your account, thereby choose a security question and provide an answer. Save the same somewhere else and this will be used at the time when you forgot your password. — Enter your original Date of birth as mentioned in your Pancard or any other government issued valid ID card. — A security Pin thus helps to add more security to your account. Security pin will be asked everything when you made any changes to your account like changing profile, withdrawing money, adding or removing bank account, debit or credit cards. Now that’s all, your Payza account ready for use. You can now note down your Gmail Id used for registration and provide in all online jobs sites where ever they require. Your Gmail Id is just like your account number and can be used to identify, send or receive money from and to your Payza accounts. Add Bank account and Debit / Credit card with Payza? So you have registered your Payza account. Now, you need to link your Bank account and Debit card or credit card to send and receive money through your Payza account. This is a simple process. Login to your Payza account and look into the left side navigation menu. Fill your First name, 16 Digit Card number, Expiration Date, Billing currency and press next. You will be asked to confirm once again the details you typed. If you ok, then press Add a credit card. Now your card will be added to your Payza Account. STEP 12: Click Wallet >> Bank Accounts >> Add Bank Account. 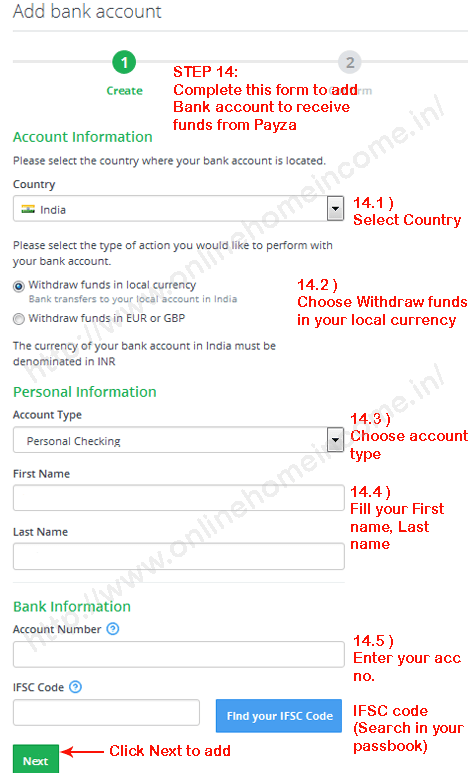 Choose your country, and select option 1: Withdraw funds in your local currency. Choose your account type and fill your First Name, Last Name (It should match with the data’s provided during registration), Account Number, IFSC code (Search online or check your passbook). — Now press Next and you will be asked to confirm once again all details you typed. Now click Add Bank Account. Then it will be added and associated to your Payza account. How to verify your Payza Account? Your Payza account will be put under locked status as long as you complete your verification process. 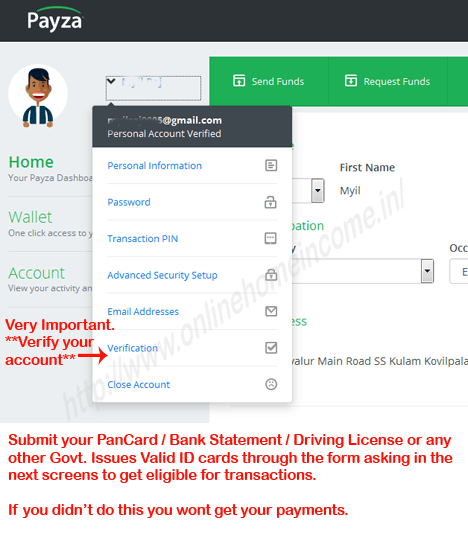 Because you must prove that you are a real person who authorized to operate this Payza account and the linked bank account and debit or credit card. Login to your Payza account and click the arrow next to your Name and choose Verification. Verification includes two processes, Photo ID and Proof of address. — Upload any documents such as Bank Statement, Phone Bill, EB Bill, Ration card for proof of address. After uploading these two documents, your account will be put in a queue for verification. Once your documents found to be valid, your Payza account will be activated and you can use all features from your account. Payza is 100% safe and this is the only way to get payment from online jobs without risk and in the shorter time. Usually, payment process will take 5 – 7 business days. I am using Payza since 2009 and still haven’t faced any issues with their services. They are having live support, phone support, email support available throughout the day to resolve their member’s problems at a fast rate. 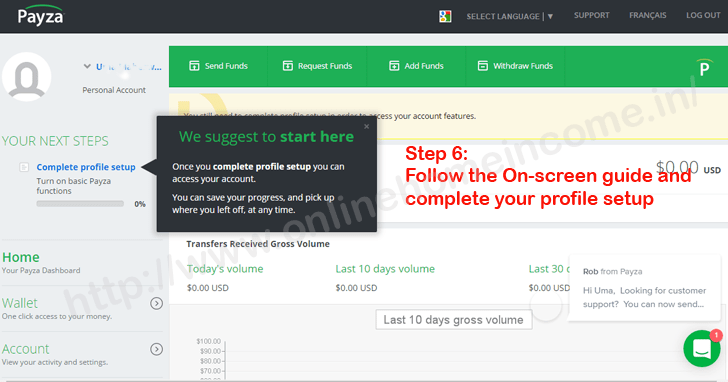 Clixsense Reviews 2019: How to Make Money? Is it Legit?